Booker rushed 34 times for 183 yards and a touchdown and added 38 catches for 275 yards on 51 targets in 2018. Offensive coordinator Bill Musgrave said Booker will "get a bunch of runs" in Sunday's season finale against the Chargers, Zac Stevens of BSNDenver.com reports. Booker rushed three times for 21 yards and caught three of five targets for 21 more yards in Monday night's 27-14 loss to the Raiders. Analysis: Booker was a triple threat on Christmas Eve as he added 116 yards on five kick returns in the contest. He saw his first rushing attempts in three weeks while Phillip Lindsay was knocked out of the game with a wrist injury. If Lindsay is unable to go Week 17 at home against the Chargers, Booker would stand to see another handful of rushes in addition to his usual allotment of targets. Booker caught two of three targets for 17 yards during Saturday's 17-16 loss to Cleveland. Booker caught both of his targets, gaining 11 yards during Sunday's 20-14 loss in San Francisco. Booker caught both of his targets for 38 yards and added a 4-yard carry during Sunday's 24-10 win over Cincinnati. Booker caught one of two targets for six yards during Sunday's 24-17 win over the Steelers. Analysis: Booker has now not recorded a carry in consecutive games and in three of his last five contests. His role is pretty strictly as a pass protector and occasional third-down target. On Sunday, he saw just six offensive snaps, well behind rookies Phillip Lindsay (36) and Royce Freeman (15). Sunday brings a weak Bengals defense ranked in the bottom 10 of the league against the pass and the run, but Booker likely will not get enough opportunities to capitalize. Booker played 11 of the Broncos' 56 offensive snaps (19.6 percent) and finished with a four-yard reception on his lone target in Sunday's 23-22 win over the Chargers. Booker rushed for 15 yards and a touchdown on three carries and added two catches for nine yards during Sunday's 19-17 loss to Houston. He fumbled during the contest. Booker tallied 78 rushing yards on nine carries and reeled in all four of his targets for 23 yards in Sunday's 30-23 loss to the Chiefs. Booker could experience more offensive snaps Sunday at Kansas City in the absence of Royce Freeman (ankle), Ryan O'Halloran of The Denver Post reports. Analysis: Phillip Lindsay (90 touches) and Freeman (75) largely have split the work out of the backfield through the first seven games of the season. Meanwhile, Booker has tallied 13 carries and 16 catches. Expect Lindsay to earn the majority of rushes between the tackles and in the red zone, but Booker's snap and touch count is due to increase while Freeman tends to a sprained ankle. Booker brought in his only target for -1 yards during Thursday's 45-10 win over the Cardinals. 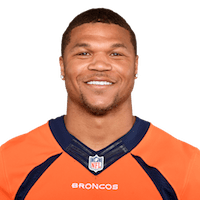 Analysis: Booker did not log a single carry behind Phillip Lindsay and Royce Freeman, and lost a yard on his only target in the passing game. The third-year pro played only six offensive snaps during the Week 7 contest and remains firmly locked into the No. 3 role in Denver's offense. Booker rushed for 15 yards on two carries and added 14 yards on two catches during Sunday's 23-20 loss to the Rams. Analysis: Booker actually ended Sunday second among Denver's backs in snaps, 22 to 20 over rookie Phillip Lindsay. Booker still ended up last in the all-important touches category, however. The Utah product is a strong third-down option as a receiver and will get a favorable matchup Thursday against Arizona, but he has yet to see enough opportunities to warrant much fantasy consideration. Booker caught five of six targets for 59 yards during Sunday's 34-16 loss at the Jets. Analysis: Booker's first touch didn't come until the Broncos' final drive of the first half and the team already down by two scores. Booker's 22 snaps were third among backs Sunday, and he has just one carry over the past two weeks. He doesn't seem to fit into Denver's plans in the run game with his value primarily coming on passing downs. An active Booker probably isn't great for Denver on Sunday: The Rams rank 29th in opponent yards per carry but 17th in opponent quarterback rating. 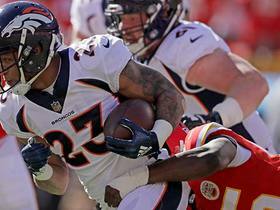 Booker caught one of two targets for nine yards and added a five-yard carry during Monday's 27-23 loss to Kansas City. Analysis: Booker saw an uptick in usage following Phillip Lindsay's ejection in Week 3 but garnered just 8 percent of the stable's touches in Week 4. Booker is so far behind rookies Royce Freeman and Lindsay on the totem pole that he doesn't project as a fantasy factor, even against a middle-of-the-road Jets run defense in Week 5. Booker caught five of seven passes for 34 yards and added 10 rushing yards on five carries during Sunday's 27-14 loss in Baltimore. Analysis: Booker narrowly missed leading the Broncos' stable in offensive snaps, falling short of Royce Freeman 29 to 26. The snap count and touches were a product of rookie Phillip Lindsay's first-half ejection. The Broncos' offense has been at its best riding Lindsay and Freeman with Booker firmly in a No. 3 role. He might have a bit more value on Monday, however, given his receiving ability and the Chiefs' bottom-ranked pass defense. 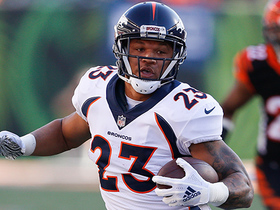 Booker rushed for 17 yards on three carries during Denver's 20-19 win over Oakland. Booker ran for four yards on two attempts and nabbed two passes for 11 yards during Sunday's 27-24 win over Seattle. Analysis: It was just a week or so ago that Booker was set to be the starter, or at least the co-starter, in Denver. He ended up ranking third among the team's backs with 19 offensive snaps. His four touches were significantly fewer than rookies Phillip Lindsay (17) and Royce Freeman (15). Lindsay topped 100 total yards in his first career game -- something Booker hasn't done since Week 12 of 2016. Booker's stock is falling. Fast. Booker's teammate, Royce Freeman, is slated to be listed as the Broncos' No. 1 running back on the team's initial depth chart, Troy Renck of Denver 7 News reports. Analysis: Booker still has a chance to make his mark in the Denver backfield, notably in passing situations, which sets the stage for him to merit PPR consideration. Meanwhile, it appears as though Freeman will have an opportunity to carve out an early-down role for the team, a reality clearly reflected by his ADP, which is far higher than Booker's. 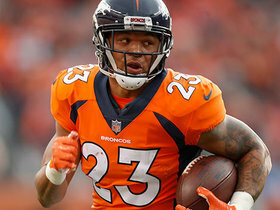 Broncos head coach Vance Joseph suggested Tuesday that whie Booker could be on the field for the team's first play in the Week 1 contest against Seahawks, it wouldn't necessarily mean that he claimed the starting running-back gig over Royce Freeman, Zac Stevens of BSNDenver.com reports. Booker took three carries for nine yards in Friday's preseason game against Washington. Booker rushed four times for 17 yards during Saturday's preseason game against the Bears. 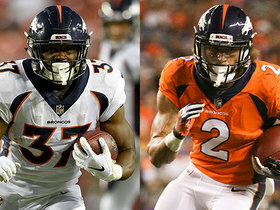 Analysis: The Broncos split first-team work between Booker and Royce Freeman and, just like last week, the rookie seemed to be the superior option. Booker's stock is clearly trending downward at this point, though the third-year back will get at least one more chance to prove his worth during the Broncos' third preseason game next Friday against the Redskins. Booker rushed twice for seven yards during Saturday's preseason opener against the Vikings. Analysis: Booker, who was listed as the No. 1 running back on the initial roster, barely saw any Saturday so it's hard to compare his performance to that of rookie Royce Freeman. However, Freeman was very impressive on his similarly low four carries, one time busting a 23-yard run to the house. This battle for the No. 1 job could come down to the wire, but after the preseason opener, it seems as if the momentum is on Freeman's side. Booker is listed as the starter on the Broncos' preseason depth chart, Nicki Jhabvala of The Athletic Denver reports. Rookie third-round pick Royce Freeman will compete with Booker for the lead back role, according to the team's official site. Following the release of C.J. Anderson, the Broncos are reportedly very high on Booker's future, Benjamin Allbright of 104.7 FM Denver reports. Booker carried the ball 79 times in 2017 for 299 yards and a touchdown and added 275 yards on 30 catches in 2017. Booke ran for 47 yards on eight carries and picked up another 24 yards on five catches during Sunday's 27-11 loss in Washington. He fumbled during the contest. Booker rushed 11 times for 39 yards, brought in his only target for 10 yards and returned one kickoff for 23 yards in Thursday's 25-13 win over the Colts. Analysis: Booker played a diversified role, but he still lagged as a distant second behind C.J. Anderson for work in the ground game. The second-year back has been firmly slotted into a complementary role over the last four games, and given Anderson's success Thursday, that doesn't appear likely to change over the season's final pair of contests. The 25-year-old offers some upside through his work in the passing game as well, but his volume remains too scant to trust in the fantasy postseason. Booker rushed for 22 yards on nine carries and added 12 yards on two catches during Denver' 23-0 beating of the Jets. Booker rushed just twice for eight yards and secured his only target for no gain in Sunday's 35-9 loss to the Dolphins. Analysis: Thought to be the emerging lead back just two games ago after logging 14 carries versus the Bengals, Booker has tallied just eight rushes and three receptions combined over the subsequent pair of contests. The downturn has coincided with Bill Musgrave's ascension into the offensive coordinator role, and with even Jamaal Charles garnering more opportunities through both the ground and air Sunday, Booker's fantasy stock looks to be decidedly depressed for the time being. Booker rushed for 11 yards on six carries and added 22 yards on two catches during Sunday's 21-14 loss to Oakland. Analysis: Booker circled out of the backfield in the second quarter and caught a dime from Paxton Lynch for 19 yards, just barely missing the touchdown. Lynch tossed a pick a few plays later and the rest was all down hill. Booker has seen a sharp uptick in usage in recent weeks and led Denver's backs with 26 offensive snaps on Sunday. With Booker the most likely of Denver's trio of backs to be on the squad in 2018, expect Denver to continue to feed him to see what they have for next year. Booker carried 14 times for 44 yards during Sunday's 20-17 loss to the Bengals. He also caught five of six targets for an additional 54 yards. Analysis: Booker easily had his best game of the year in this one, setting season highs in touches and scrimmage yards. He managed just 3.1 yards per carry, but an effective day as a pass catcher enabled a useful outing for fantasy purposes. Booker's workload has increased in each of the previous three games, culminating in this encouraging performance. With his fantasy value trending upward, the second-year back will look to head the backfield once again next week against the Raiders. Booker rushed for 24 yards on eight carries and added a five-yard catch during Sunday's 41-16 loss to New England. Analysis: The Broncos keep teasing Booker's emergence in the offense, lauding his versatility and big-play ability. In practice, the second-year back has topped 40 total yards just twice in six games and has scored once. The Broncos are a meandering offense with three backs splitting carries -- not an ideal situation to hang one's hat on counting for week-to-week production. Booker rushed for 21 yards on six carries and added nine yards on two catches in Sunday's 51-23 loss in Philadelphia. This slick move nearly sends Denver Broncos running back Devontae Booker into the end zone. 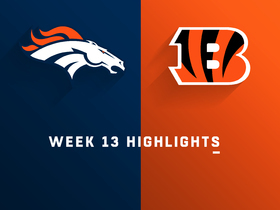 Watch highlights from the Denver Broncos Week 13 matchup vs. the Cincinnati Bengals. Denver Broncos running back Devontae Booker catches for a 30-yard gain vs. Cincinnati Bengals. 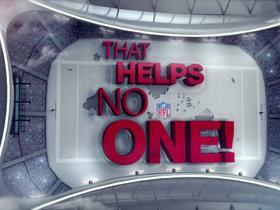 The "NFL Fantasy Live" crew discuss players who helped no one in fantasy during Week 9. 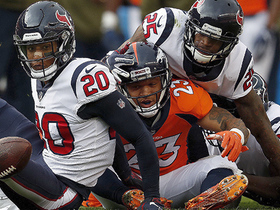 Houston Texans safety Justin Reid recovers a fumble by Denver Broncos running back Devontae Booker. Denver Broncos running back Devontae Booker bounces outside on his 14-yard touchdown run. 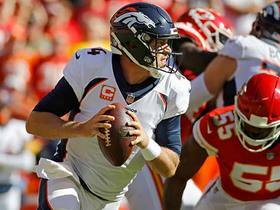 Kansas City Chiefs linebacker Dee Ford strips Denver Broncos quarterback Case Keenum, as Breeland Speaks recovers the fumble. Denver Broncos running back Devontae Booker finds the hole and bursts through for 26 yards. 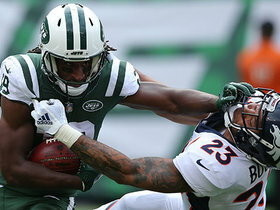 New York Jets wide receiver Andre Roberts stiff-arms the first Denver Broncos defender, spins around the second Denver Broncos defender and proves his strength with the tackle of 5 Denver Broncos defenders for a punt return for the New York Jets. NFL Network's Terrell Davis talks about who's winning a running back spot on the Denver Broncos roster.